Catherine Florence Hans was born on 27 March 1906 at Washington, District of Columbia. She was the daughter of John Jacob Hans and Catherine Margaret Albert. Catherine Florence Hans was listed as the daughter of John Jacob Hans on the 1910 census on 21 April 1910 at 711 14th Street SE, Washington, District of Columbia.1 Catherine Florence Hans lived between 1912 and 1926 at 509 3rd Street SE, Washington, District of Columbia. Catherine Florence Hans married Francis Joseph Jennings, son of Michael Edmond Jennings and Ellen Frances McGovern, on 26 December 1925 at St. Peter's Catholic Church, 313 2nd Street SE, Washington, District of Columbia, officiated by Catherine's uncle, Father Egbert Albert.3 From this day on Catherine was known as Catherine Florence Jennings. She lived between 1926 and 1927 at 210 W Curtis Street, Tampa, Hillsborough County, Florida. She lived between 1928 and 1966 at 509 3rd Street SE, Washington, District of Columbia. Catherine Florence Jennings was listed as the daughter of John Jacob Hans on the 1930 census on 5 April 1930 at 509 3rd Street SE, Washington, District of Columbia. 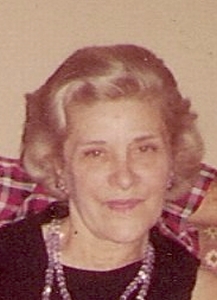 Also included in the household was a roomer, Gwendolyn Baker.4 Catherine Florence Hans was nicknamed circa 1947, Bambi. From this day on Catherine was known as Catherine Florence Blackwell. Catherine F. Jennings married Elmer Franklin Blackwell on 14 August 1965 at St. James, Ridge, St. Mary's County, Maryland. Catherine Florence Hans died on 22 December 1999 at 22680 Cedar Lane Court Apt. 1233, Leonardtown, St. Mary's County, Maryland, at age 93. She was buried on 28 December 1999 at Arlington National Cemetery, Arlington, Virginia; Section 70.